As part of my celebration, I cancelled classes on Good Friday and headed to Chengdu. 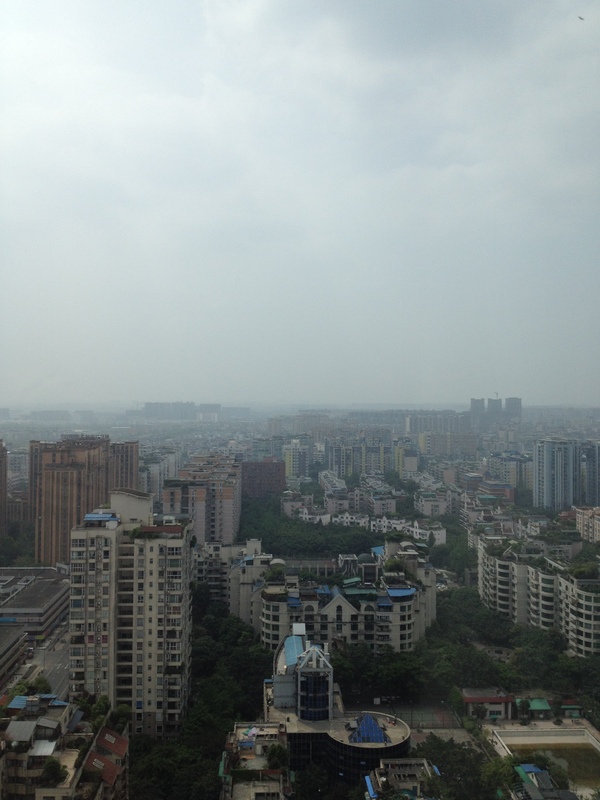 No budget hotel for me this time – I booked a room at the Renaissance Hotel in downtown Chengdu. By Chinese standards, this hotel is super luxury, like one rung below a Ritz-Carlton. The Ritz-Carlton is in the heart of the city, where the Renaissance is a little ways down the Renmin Road. If it were Chicago, one is Michigan Ave, the other is Illinois or Ohio by the Lake. In any case, the room was still only 120/night US, which is just out of my normal hotel price range. Because my dad has been accruing Marriott points for several years, and has almost achieved permanent platinum status (brass ring, Dad! ), I got a free upgrade. They put me in a suite on the 31st floor – the view was incredible. You know it’s chic when the water bottles cost $5. I mean, seriously?! Walk half a block up the street to the WoWo and buy a giant bottle for $.75 – that’s what I did. I might be imitating the high life, but I’m not stupid. Yes, I did open my curtains and cry out “Behold! I am Jean – and I am really high! In the air, I mean…” Yeah, I self-censor even when I’m by myself. I had to force myself to go out – all I wanted to do was set up my computer in front of the window and write and stare. But I do – I go to the mall to look at clothes for when I get my next paycheck and can afford to buy them. After sunset I return to my one room palace. The TV plays HBO – English movies! I mean, they weren’t good movies. I watched “G.I. Joe: Retaliation” and “The Man with the Iron Fists” (the latter is horrible, except for Russell Crowe). No “Game of Thrones” unfortunately, but I was happy anyway. The hotel was like a bi-lingual oasis. Yes, again I have to admit that I see the allure of greater Western influence here. It was nice not to have to struggle through every single bit of dialogue, to say things three or four times in Mandarin, only to have my attempts brushed off because I don’t speak Sichuan dialect. And not only did the breakfast buffet have a really great spread of dim sum and Asian dishes, it had Western food – pancakes, bacon, bread. REAL BREAD – not sponges. And there is butter and cheese! I haven’t had cheese since I got here (I don’t think – actually, I might have had melted fake cheese on something. Hmm…) Is it wrong to be so happy to see foods from my side of the ocean? Perhaps. But I have been a really good sport about eating local – I’ve sucked down catfish heads, feet, knuckles, blood, and brains – most of coated in chili oil, and most of it tasty. I think having a bit of brie for breakfast is a reward. Today I went to see the pandas. 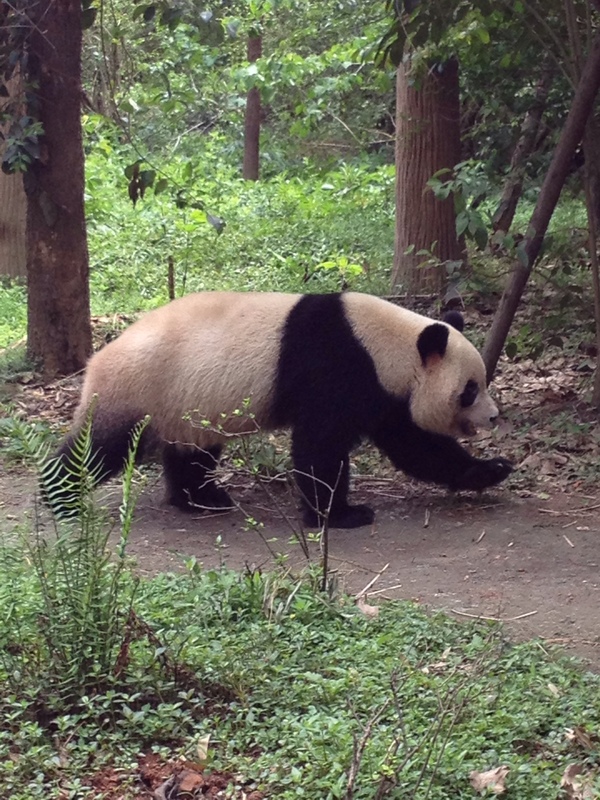 The Chengdu Panda Research and Breeding Center – great for Panda and tourist spotting! Pandas are not on my radar of favorite animals. Red pandas yes, but the panda itself? I feel it gets a lot of attention without me. But Chengdu has an internationally recognized breeding center, and so I catch a cab and head out. I’m glad I did –the weather was perfect in the morning, and the center is actually more like a zoo/park. Things were blooming, there were peacocks and wild birds singing. Technically, the peacocks weren’t singing – they were making that “a-ah!” noise they do. The pandas were awake and rolling about – they’re cute and all. I guess I look at them and see a creature that over-evolved. They only eat bamboo – one food. It’s not just that rapid industrialization has wiped out most of their territory, but bamboo forests die off every ten years or so. Whole forests – just gone, and the pandas have to move and find new food. The panda evolved to live in China so well it cannot live anywhere else, and China is destroying their only food source. Yes, they’re cute – sort of. Now, I am going to give you some travel advice: If you’re going it alone, and you make a mistake, try to do it where no one can see you. Specifically, if you say no to the taxis because you want to take the bus, be damn certain the bus stops where you think it does. Because if it doesn’t – if you have to pull a 180, and those taxi drivers see you, it’s game over. They have you. 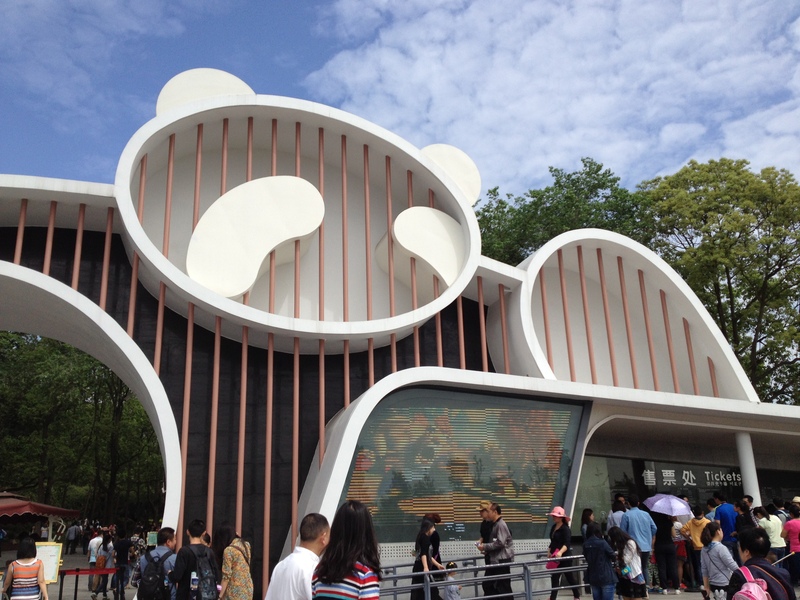 Did you know that the number 25 bus does not stop in front of the Panda Research center? It doesn’t. Then he made small talk. It was the most casual Chinese I’ve ever practiced saying. Jerk. I went to the Tibetan Quarter to look for this bracelet I wanted, but I did not find the store. The sun was setting – I hadn’t meant to spend all day walking. I meant to be back around lunch time, so I could sit and be queen of Chengdu and write. Oh well. For dinner I ordered room service and took a bath – yes, my room had a tub. It also had – and this creeped me out – a little red light in the mirror. I noticed it when I went to use the bathroom. There were some exposed wires under the mirror leading up into it, and they didn’t seem to be related to the mirror lights. So, I gave it the finger – the red light, that is. If it’s a camera, then that is not cool and I want them to know. If it’s just a motion sensor so the light doesn’t stay on – well, I gave myself the finger and I’m paranoid. Tomorrow is Easter. I’ve researched and found a Church which looks easy to find (ha) – the Church of the Immaculate Conception. 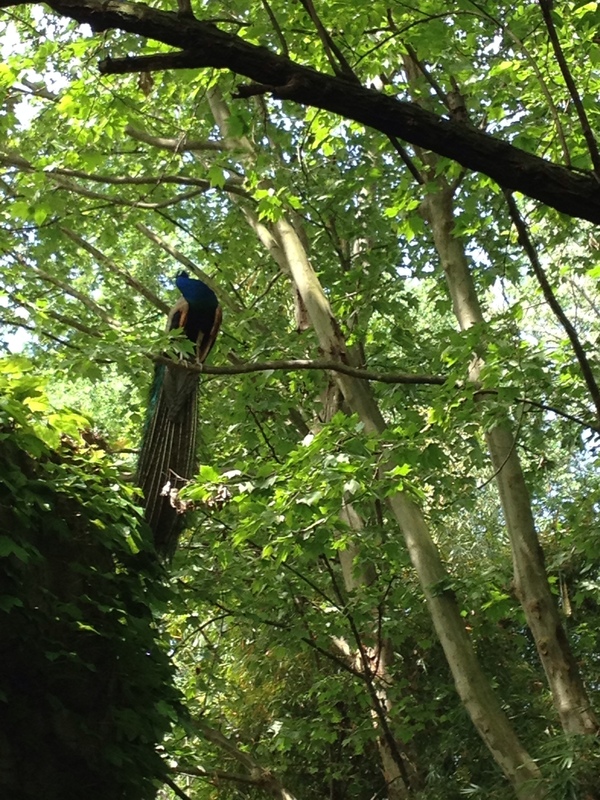 For my last picture – a peacock in the trees. 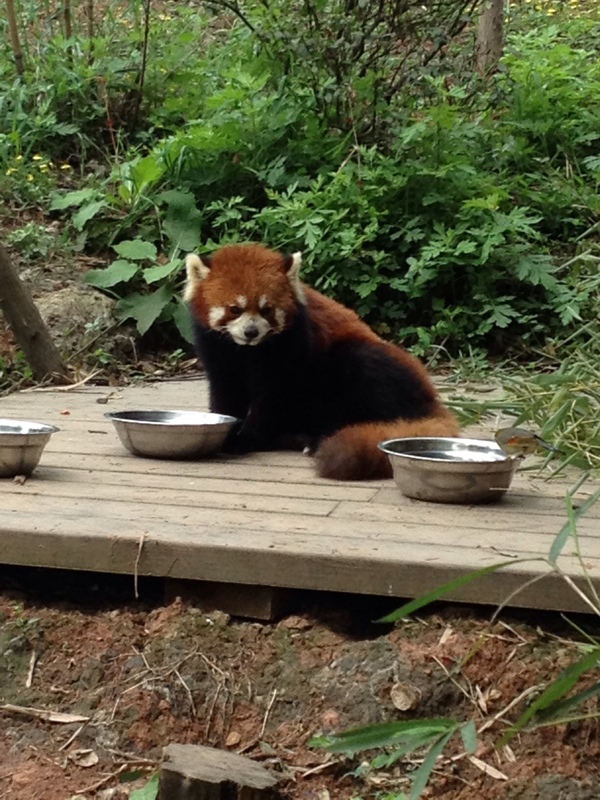 This Post was posted in Observations, Places, Reflections, Travel and tagged Chengdu, Chengdu Panda Breeding Center, China Travel, imperialism, living abroad, luxury hotels, overpriced water, pandas, red pandas, Renaissance Chengdu, taxis, Tourism. Bookmark the permalink.